I'll be honest, I didn't really know a lot about the new Revlon Colorstay shadowlinks, but my boyfriend was really excited to buy me some because he's a sweetheart and he knows how much I love eyeshadow. 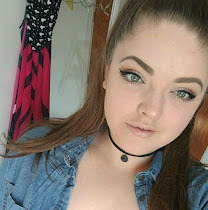 So when we went into Boots he asked me which ones I wanted and I told him he could choose... he did an amazing job, let me just put that out there. I never would have chosen the colours that he picked out for me myself, but they are beautiful and I can see myself getting a lot of use out of them. I've read some bad reviews about them but I myself disagree and I really like them! This post will be about the three pink/purples and the next one will be about the other 3 which are from the blues and greens (the collection is split into colour categories). From left to right, the colours that I have are 'Plum', 'Purple' and 'Candy'. 'Plum' is a matte, deep plummy purple (duh) in the pan and on the skin it comes up even darker and I would say it's almost an aubergine purple. 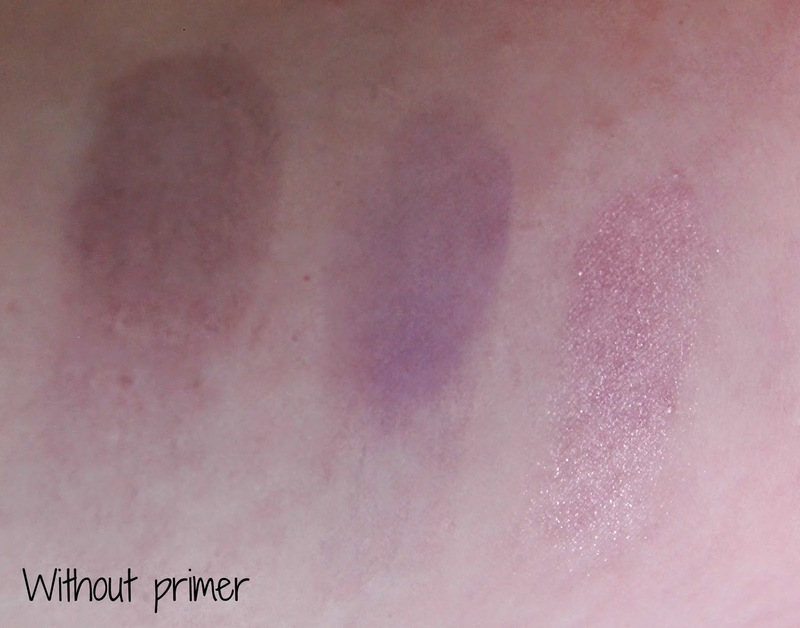 'Purple' is a lovely matte, light to mid purple and the colour doesn't differ too much on the skin. I really love this colour. 'Candy' is a shimmery baby pink, which reminds me somewhat of 'Dust' from the Naked 3 pallette. 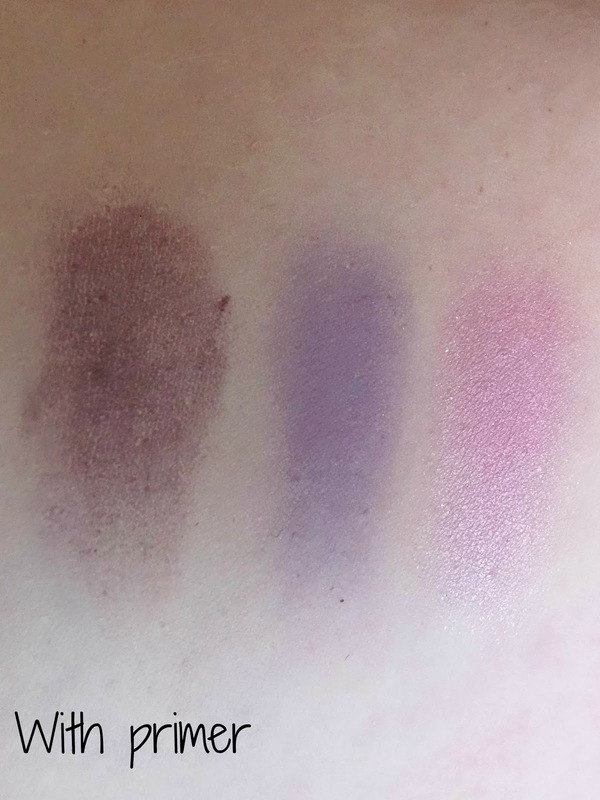 As you can see from the pictures, without a primer, the shadows don't have much colour payoff, but this doesn't bother me because I always use a primer underneath my eyeshadow and it isn't too much effort even if you don't usually need one, to just apply a little bit underneath. Having said that, on the eyelids, even without a primer the colour is still visible and just working a little bit more onto the lid gives a stronger colour. However, with a primer the colours are a lot bolder which is to be expected really. These shadows are really easy to blend and so far I haven't had any fall-down with any of them. The only negative that I will point out is that 'Candy' is a little bit chalky in the pan but once it's on the skin it's beautiful to work with. At £2.99 each I think these are great eyeshadows and I love that you can link them together to create your own colour combination or palette almost, and I haven't seen anything like this with 'drugstore' products before. I think it's a really good idea. Keep an eye out for the next post featuring the blues and greens! Have you tried the Revlon Colorstay Shadowlinks?